To maintain the finish, mild dish soap or a damp cloth is recommended for cleaning up after spills, just as you would clean woodwork. Vinegar can also be used. If a mild abrasive is needed, baking soda toothpaste works well when applied with a soft damp cloth. For additional protection, there are many products on the market, and some are hazardous to your furniture's health. Cleaners such as Pledge and Murphy's Oil Soap are not recommended because they leave a dull residue on the finish. Never use products containing ammonia on water base finishes. Polishes such orange oil work well for routine maintenance. To prevent splitting, maintain even humidity conditions in your home. Do not place hot pots and laptops directly on surface. When hot objects are left on a wood surface for an extended period, damage may occur. Use a trivet or placemat. To maintain the finish, clean surface with a damp washcloth and wipe dry. Cleaners such as Pledge and Murphy's Oil Soap are not recommended because they leave a dull residue on the finish. Water based surfaces may be cleaned with a damp cloth or General Finishes Orange Oil. Do not use household cleaners or window cleaners. Paste wax is not recommended because it builds up and yellows, thus becoming a maintenance problem. Water Based Top Coats may be recoated at any time in the future. Remove any grease or dirt, lightly sand with #320 or finer grit sandpaper, and then apply another coat. It's important to let your final coat cure for a period of 14 days to reach optimum hardness. You may use your project sooner, just treat it with special care during the curing period. 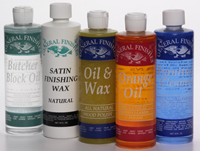 To maintain the finish, use General Finishes Orange Oil or just a damp cloth. Paste wax is not recommended, because it builds up and yellows, thus becoming a maintenance problem. To rejuvenate an old dull finish, simply clean surface well with mineral sprits and '0000' steel wool and apply one of General Finishes Oil Based Top Coats.